There are a lot of theories to explain King County's recent real estate cooldown — from interest rates to foreign buyers to Seattle falling apart — and the data shows some have merit while others are likely fiction. 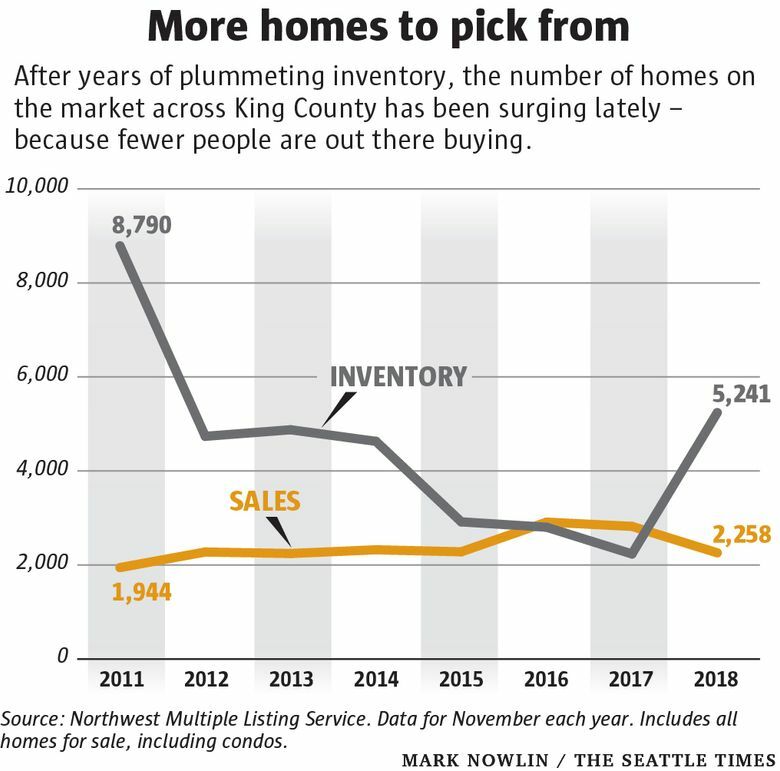 After years of skyrocketing home prices, why has King County’s real estate market begun going in the opposite direction? There’s no slap-you-in-the-face-obvious reason. But there are several factors affecting the market, and probably a few myths that need dispelling. 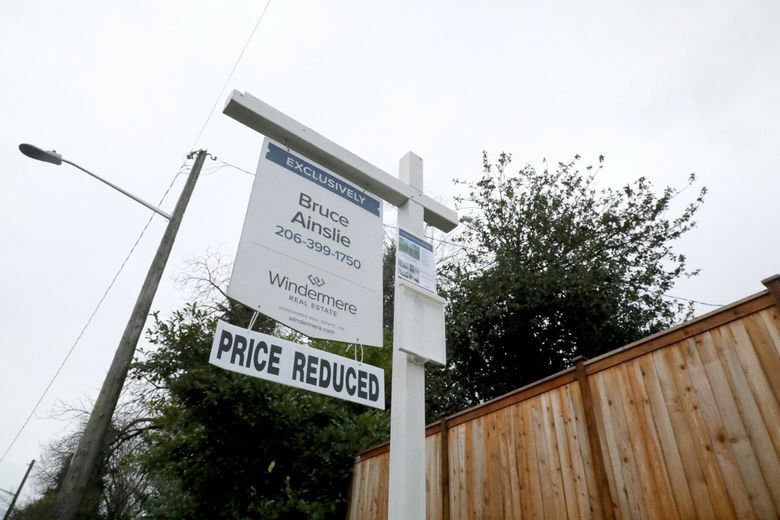 First, a quick overview of where we’re at: From the time the market bottomed out in early 2012 to spring of this year, King County single-family home prices surged an ungodly 136 percent, reaching a new median of $726,000. But since then, in just six months, prices have retreated 11.3 percent, to $644,000. Since 2000, the only time prices dropped more in any six-month span was in late 2008, during the housing bust. Outside of a few seasonal declines here and there, Seattle metro area home values have only meaningfully dropped three times since 1990. There have also been three U.S. recessions during that period. You can probably guess that they coincided: Prices dipped slightly during economic downturns in the early 1990s and 2000s, and plummeted during the big crash a decade ago. But we aren’t in a recession right now — if anything, the local economy is thriving, at least in a big-picture sense. So what’s going on? The total number of homes listed for sale has roughly doubled in the past year and is at its highest point since the market was bottoming out in 2011. But people are putting their homes up for sale at the same rate as in the past. It’s pretty simple: With fewer buyers competing over more homes, the days of furious bidding wars that jack up home prices are over. The average buyer actually now has enough negotiating power to get a house for less than the list price; and in about a fourth of listings, sellers are just lowering their asking prices because they didn’t get any nibbles. It’s part of a national trend of inventory finally starting to rise slightly; prices are even falling a tad in a few West Coast cities, like Portland and Vancouver, B.C., though the changes have been more dramatic here than anywhere else. OK, so why are fewer people buying here? A big reason might be mortgage interest rates, which get a lot less attention than home prices but can have a significant impact on affordability for the three-fourths of local homebuyers who take out a mortgage. After years of historically low interest rates, they began rising at the start of this year. The increase has implications for what house hunters can afford to buy. Someone with a $2,360 monthly housing budget could have afforded a $600,000 house in May, when prices peaked; that same budget now gets you a house for $580,000, just because interest rates have grown in that span. The truth is that the bulk of the interest rate increase happened at the beginning of 2018, when the market was still humming along. Also, mortgage rates change fairly evenly across the country, and yet other cities facing the same interest rate increases haven’t seen prices fall as much as Seattle has. And rates have started to drop back down again in the past month or so, yet the market hasn’t bounced back. Some brokers, eager to reassure jittery buyers, have tried to brush aside the downturn as being a simple function of normal seasonal swings in the market, though that’s not the case. 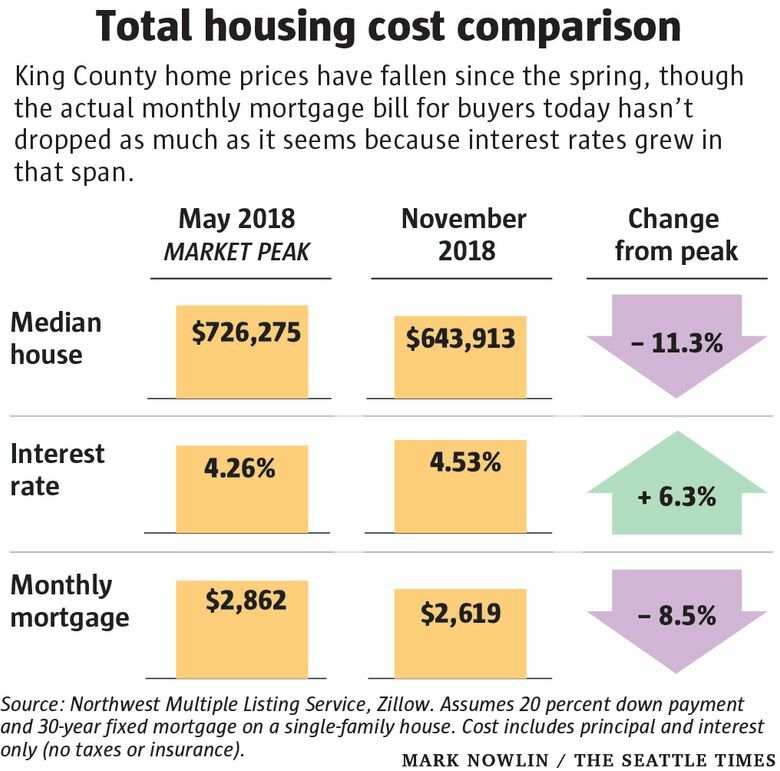 Going back two decades, home prices in King County actually grew a slight 1.7 percent on average between May and November, the timeframe for this year’s drop (that figure excludes the housing-bust years, when prices fell constantly no matter the season). There’s no great data on the frequency of international buyers here, since it’s not tracked, and efforts to do so have been stymied by concerns of racial bias. But brokers and buyers have reported a noticeable dip in competition from foreign buyers, who have an outsized presence in the market since they often come in with large, all-cash offers that can be impossible to compete against. The anecdotes are backed up by reports that tighter capital controls in China — where the most foreign buyers here come from — have made it harder for residents there to get their money out of the country, as well as surveys showing general declining interest in U.S. real estate from buyers in China. 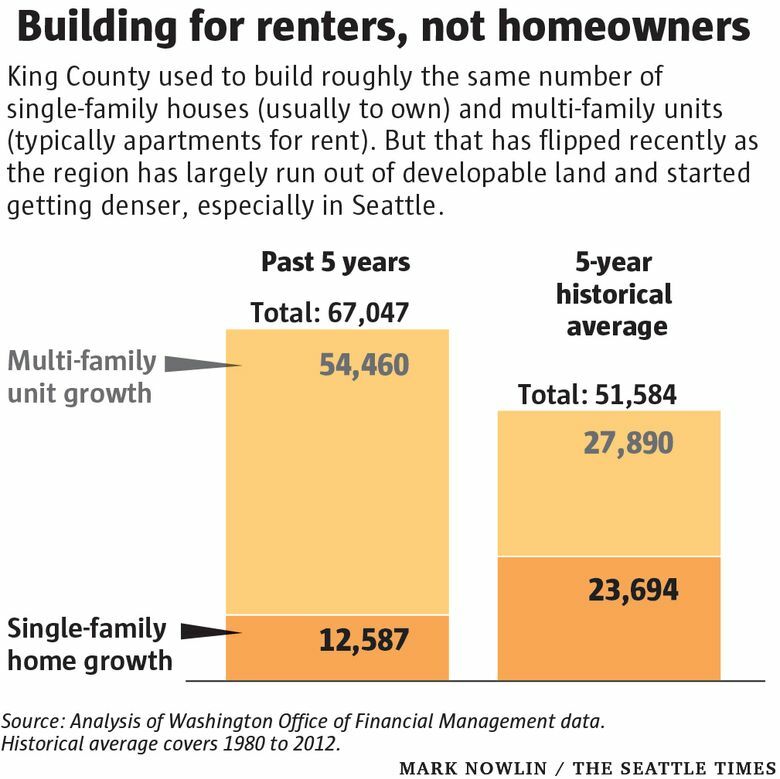 When I’ve posted about falling home prices on Twitter recently, some pro-construction-types have tried to make the connection that falling prices are the result of Seattle’s building boom. But that might be a stretch. It’s true that the flood of new apartments hitting the market has helped keep rents flat in the past year, which certainly puts less pressure on renters to buy now to escape skyrocketing rents. But the rental market first began cooling way down last winter and spring, and the homebuying market was still as hot as ever back then. There are signs the construction frenzy may be helping buyers in the condo market, however, as developers have started to gradually switch from apartments to condos in the past several months, with new buildings opening and pre-sale opportunities available for some projects underway now. King County condo inventory is up a whopping 244 percent over historic lows reached a year ago, and prices are down 13.1 percent from the spring — both representing more significant changes than in the single-family home market. You’ve heard the rhetoric: Amazon is abandoning Seattle. The traffic is unlivable. Homelessness and crime are out of control. Everyone’s moving out. Plenty of anti-Seattleites point to the real estate market downturn as proof the region has gone full “hellhole” (as Fox Business described Seattle in 2017). Most of the claims are overblown. For instance, Amazon, despite its forthcoming expansion in New York and Virginia, is still hiring like crazy here (with 8,800 full-time job openings in Seattle, up from 8,200 a month ago) — as are Google, Facebook, Apple and others. The overall hiring rate here is actually slightly higher than last year, according to LinkedIn. And the number of new people flowing into King County from out-of-state and out of the country — as measured by driver’s license registrations — has been the same so far this year as it was last year. There’s even the same number of Californians — often blamed for bidding up homes here because they’re generally cheaper than in the Golden State — moving here this year as last year. Redfin earlier this year reported a net outflow of Seattle-area home shoppers on its site — that is, more people here were looking to buy elsewhere than there were outsiders looking to buy here, a new trend. But even that data has since flipped back, with more searchers looking to move here than move out. Regardless, it’s true that Seattle and its suburbs have gotten increasingly harder to live in over the years, and nowhere is that clearer than in the homebuying market. From 2010 to 2017, home prices across the metro area soared 54 percent while incomes grew 16 percent. Buyers and brokers have reported fatigue here and in other pricey markets around the country that are slowing down — the theory being that at some point, the region hits an affordability ceiling and essentially runs out of high-income households able to buy all those expensive homes. For the full metro area, the household income required to afford the median home is now about $105,000, up from $75,000 four years ago. But in the city of Seattle and most of the Eastside, the salary required to buy the typical house now tops $150,000. By comparison, the actual median household income in King County is about $83,600. Of course the simplest explanation for the current drop in home prices may be just that the downturn is temporary, a small blip that we look back on with a shrug. That happens from time to time, albeit typically on a shorter scale; prices dipped for a couple months here in fall 2014, or in San Francisco in mid-2016, before going right back up again. With the normally slow winter market now upon us, we likely won’t know the full answer until the spring, when prices almost always float upward.